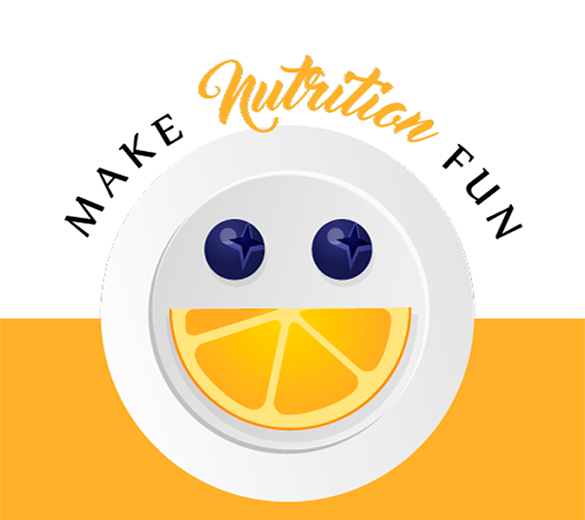 As the Founder and Executive Director of a nonprofit organization focused on nutrition and wellness, I have been actively involved in the “farm to table movement” for over ten years. I’ve been involved in everything from creating community gardens for low-income families, to garden education, to cooking and nutrition classes. I enjoy working with both adults and kids- getting them into the garden and close to their food. 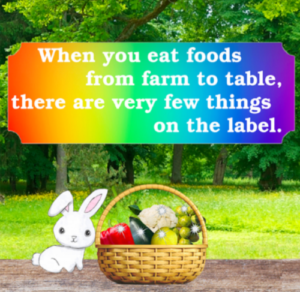 The first three images in this post are is from my latest children’s book (Where Does a Rainbow Grow?) 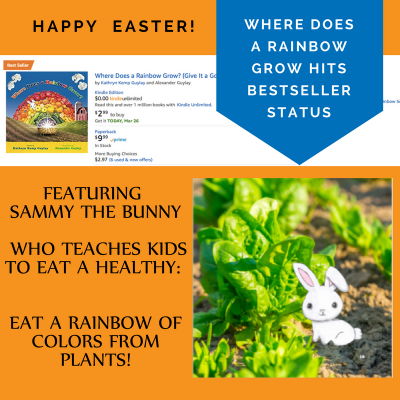 that gets kids excited about eating a healthy rainbow of fruits and veggies. 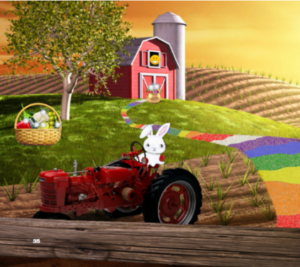 The cute bunny character is Sammy, created by my son but inspired by my daughter’s real bunny named Sammy. You can learn more about the book at the book’s website. But let’s move on to the WHY. WHY get kids and families in the garden? Here are my top three reasons. Having a family garden gives us power in the food chain. We have the ability to affect the food chain, and the answer lies right in our backyards. When push came to shove during WWII and produce was rationed, “Victory Gardens” were planted coast-to-coast—an estimated 20 million of them. By the war’s end, Victory Gardens were turning out 40 percent of the nation’s produce output, and big farms were freed up to supply the troops. The statistics describing the success and productivity of Victory Gardens offer a great deal of hope and possibility for us today as our nation struggles with its dependency on oil. What we feed ourselves comes from the planet, and how we treat the planet affects how we can feed ourselves. It is one big circle. Having a family garden is good for your health and wellness. Kids (and adults!) are so much more likely to eat food that they’ve grown themselves. Sometimes a good old fashioned “story” helps to paint the picture, so I’m going to share with you a re-published post from my Healthy Kids blog which shares the story of master gardener Elizabeth Matlin. Her enthusiasm grips me and makes me want to run outside and start digging and sowing! So read on below, and be inspired… Thank you Elizabeth! Have you ever plucked a ripe tomato from a vine that you nurtured for three months? Or tugged a plump rosy radish from the earth where you had planted a small seed? If so, you know the rewards of growing your own vegetables. Whenever I step into my vegetable garden, I feel happy—the kind of happiness children experience in simple, everyday things. It is my playground where I am in the present moment. Past and future disappear, and I am both energized and at peace. Vegetable gardening is not one more item on my “to-do” list. I don’t have to do it—there are plenty of sources nearby for fresh organic vegetables. 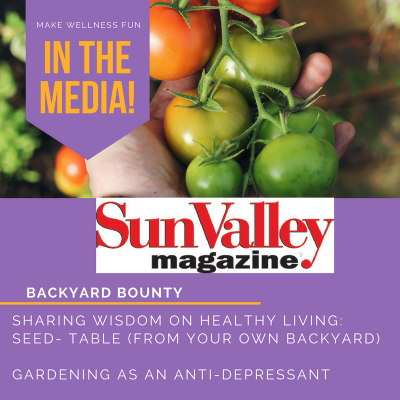 Rather, I choose to grow vegetables for a variety of reasons that I will share with you here, along with some tips and resources for starting your own garden. Perhaps you will be inspired to plant a small garden playground with your family this spring! The path to my vegetable garden has been a full-circle journey. I am an amateur, self-taught gardener who learned to love digging in the dirt at a young age. In my earliest gardening memory, I am about five years old and planting corn seeds with my mom and three sisters in two small circles of soil in our Skokie backyard. These were no ordinary corn seeds—they were popcorn seeds! I don’t think we ever harvested any popcorn, but planting seeds and watching them grow was magical. Fast forward about seven years. It’s the early 1970’s and Skokie has started a community garden. My mom and aunt each acquire a plot and my sisters and I (now pre-teens) spend many hours that summer hoeing, planting, weeding and watering vegetables. While there was some griping about the work, we gobbled the harvest of fresh-picked lettuce, tomatoes, peppers and green onions. And the shared talking, laughing and physical labor strengthened our family bonds. As the years went by, we abandoned the community plot and asked my dad to dig up some of the lawn to make bigger garden beds in our modest-sized backyard. Through my high school and college years, the lawn kept shrinking as we planted more vegetables, herbs and flowers. Every Memorial Day weekend, we headed to our favorite nurseries to buy plants and seeds, and then spent the holiday happily outside in the spring air. The herb garden was my domain. I loved to cook, so snipping my homegrown fresh herbs was a treat. Since then, I’ve always managed to have an herb garden, expanding my repertoire to include lemon verbena, cilantro, borage, chervil and salad burnet. When my husband and I moved to Wilmette a decade ago, I had no idea the village had a community garden located, ironically, not far from the former site of my great grandparents’ nineteenth century farm at Hibbard and Glenview Roads. When a neighbor told me about the gardens at Centennial Park, I was eager to re-create my childhood experience of growing vegetables at a community plot. My own yard had only one partly sunny spot where I could grow herbs and some greens but not much else. I was assigned a plot in 2003 and shared the 200-square-foot space with two neighbors. The next year, one neighbor bailed out, and by 2005 I was gardening solo. I had moderate success, even though I was not spending much time at the garden. Unbeknownst to me, however, I was experiencing a gradual internal shift. Observing and interacting with my fellow gardeners was an accidental education. Why were Joseph’s exotic Chinese greens so lush? 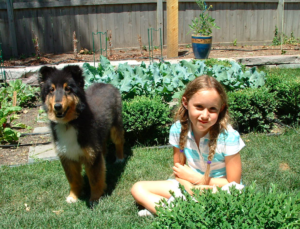 How did Jenny’s garden stay virtually weed free? (Jenny turns 92 this year and is my heroine.) What variety of peas was Joe growing, and could I also grow peas? Seemingly overnight, I wanted to expand my gardening knowledge and make my mediocre plot more productive and versatile. I started reading books and the gardening section in the newspaper faithfully—and continued to tap into the knowledge of other gardeners. Over the last three years, I’ve learned how to amend the soil; the importance of compost, mulch, raised beds, wide rows and bunny fences; companion planting; crop rotation; organic pest and blight controls; what seeds could be sown directly outdoors; how to water properly. I know I’ve still barely scratched the surface of what there is to learn and grow. I’ve also come to appreciate variables you can’t control, such as weather, insects, and animal pests. They ensure that no two gardening seasons are ever the same—how exciting is that! This year the challenge will be voles—burrowing rodents that appeared last summer and eat plant roots. Start Small: There’s a fair amount of time and muscle that goes into planting, maintaining and harvesting a garden. As with most lifestyle changes, it’s essential to start small and gradually incorporate gardening as a new activity into your schedule. If your garden is too large to easily maintain, it may become a disappointing burden rather than a positive adventure. Expand your garden space gradually each year. c) notes/comments on likes/dislikes, results, etc. I now plant a spring and summer garden and create separate plans for each season. These plans will also help with companion planting and crop rotation. Share the Experience: Ask the whole family to participate. Let your children select some of the seeds and plants. 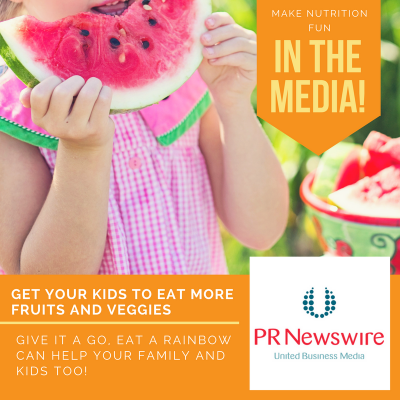 Young children can help plant seeds, pull weeds, water and harvest small items like cherry tomatoes and strawberries. Older children can each be assigned a small section to plant and maintain, even cooking their harvest for all to enjoy. Nutrition Just-picked freshness and heirloom varieties contain optimum amounts of beneficial nutrients, antioxidants and phytochemicals. Flavor Nothing compares to the incredible flavor of fresh vegetables eaten within hours—or minutes—of harvesting. Only the simplest preparation methods are needed. Variety I’ve yet to find a gourmet or farmer’s market that offers all the unique varieties of organic crops I grow, such as: purple haze and atomic red carrots; purple plum and French breakfast radishes; orange chiffon Swiss chard; tiny alpine strawberries; French purple heirloom beans; candy-cane-striped chioggia beets; rosso di sulmona garlic—you get the picture! Fulfillment A sense of satisfaction and accomplishment in creating and enjoying one of life’s basic necessities. Exercise I call it garden yoga. You work muscles in ways only gardening can provide. Balance, strength and flexibility are enhanced. Mental Health Connecting to nature and the Earth is a basic human need that most of us are not exposed to often enough. Gardening provides more than fresh air and sunshine. It reminds us how we are linked to nature and provides stress-busting therapy. It is a form of meditation. Community Interacting with other passionate gardeners and sharing my garden and harvest with friends and family enriches my life. Vegetables greens (lettuce, arugula, Swiss chard, spinach); carrots; radishes; broccoli raab; baby pak choi; beets; beans; peas (sugar snap and snow). Annual Herbs cilantro; chervil; borage. Flowers nasturtiums (these edible flowers also attract beneficial insects to the garden while repelling destructive ones). Annual Herbs basil; rosemary; thyme; lemon verbena; salad burnet; flat-leaf parsley; marjoram; dill. I plant onion sets (available only in the spring) for green onions; garlic (from cloves) and shallots (from bulbs) in the fall for mid-summer harvesting. You cannot use store-bought garlic or shallots for planting; they must be from a seed supplier. Fruit I have a small patch of strawberries at the community plot; children love picking and eating these. Herbs sage; tarragon; chives; oregano; mint (I plant my mint in terra cotta pots and in the late fall, remove it from the pots and plant it in the ground for the winter; mint is very invasive and will take over your garden if not contained in a pot.). If you allow cilantro, chervil and dill to go to seed, they will self-sow and reappear in the spring similar to perennials. Sun: Vegetables and herbs need lots of sun—at least 6 hours per day for best results. That said, I have successfully grown herbs, small fruit tomatoes (such as plum, grape or cherry) and greens (spinach, arugula and lettuce) on the east side of my home, which receives only 4 hours of full sun per day (10:00 a.m. to 2:00 p.m.). For convenience in planting at my community plot, I created a chart with an alphabetical listing of all the vegetables I plant that summarizes information on sowing, harvesting, fertilizing, rotation, positive/negative companions, etc. I also use this chart when planning my garden layout each season. Here’s a link to a sample page. 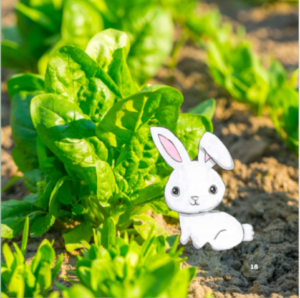 Create your own chart with the vegetables you want to plant and with the information important for you to have at your fingertips. Gardener’s Supply Company’s website (catalog/on-line company: www.gardeners.com ) has archived articles on many garden topics written by expert gardeners and a monthly gardening e-newsletter. Following is a list of seed catalogs and garden centers I have used and can personally recommend. There are many more sources available than listed here. Here is a great story in our local newspaper about healthy local school lunches.